If you live in the United States and want to bet on sports at a betting site that is both legal and online, then we recommend placing a wager at MyBookie.ag. This US-friendly online sportsbook launched in 2014, and even though they are still young, they quickly shot up the ranks to become one of the best online sportsbooks you can find on the Internet today. Here are the reasons for why we believe MyBookie belongs on our list of recommended USA online sportsbooks. MyBookie.ag is legally licensed by the government and laws of Curacao in the Netherlands Antilles. Because of their site is licensed offshore, they can offer sports gambling to all US bettors, making it 100% legal to wager on sports at MyBookie. When the site first launched in 2014, the brand didn’t get off to a great start with several bettors issuing complaints. After the public backlash, new management soon took over and righted the ship while promising to deliver a world-class sports betting experience. And after several years of delivering on that promise, the new team at MyBookie has earned the respect of bettors across America, and in the process, became one of the most well-known and trusted online sportsbooks on the Internet. When it comes to bonuses and promotions that are regularly available at a sports betting site, it’s hard to beat the offerings found at MyBookie. The sportsbook offers two welcome bonuses and three reload bonuses that are available year-round once you sign up. But if that wasn’t enough, MyBookie also has over a dozen sportsbook bonuses that rotate daily, so you can always find a bonus that gives you the most bang for your buck. And doesn’t even include the online casino bonuses available in addition to the ones offered by the sportsbook. Below you can find the bonuses that are always available at MyBookie. There are several ways to deposit funds into your account at MyBookie, and the site even accepts Bitcoin, Bitcoin Cash, and Litecoin as options for cryptocurrency which is a welcome sight. Unfortunately, there are far fewer methods to handle withdrawal requests, which isn’t too big of a deal since there are still a handful of viable methods. However, we hope increasing the number of options to withdraw is something MyBookie considers in the future. The good news is we never had any issues with deposits or withdrawals and the site matches the industry standard for transaction time. Below you can find all the banking options at MyBookie. The sheer amount of sports betting options available at MyBookie any time of day is something that simply can’t be topped. 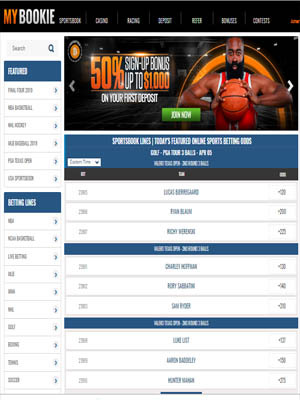 In addition to offering odds on all the major professional major sports leagues like the NFL, NBA, MLB, NHL, MLS, etc. and popular college sports like NCAA football, basketball, etc., the sportsbook also as has betting lines for soccer, golf, tennis, MMA, boxing, NASCAR, Formula 1, horse racing, WNBA, and WWE. And if you thought that was it then you are sadly mistaken because MyBookie also has lines for Esports, politics, rugby, Canadian football (eh?) alongside odds for the next pope, tv shows, movie box office openings, the gender of celebrity babies, and when certain celebrities will kick the bucket. Oh, and pinball - we can’t forget about the pinball odds. Needless to say, when it comes to options, MyBookie has got you covered whether your wager is on sports or pretty much anything else. One other option that players have at MyBookie is wagering on sports via live betting or as it’s sometimes referred to as “in-play” betting. Basically, gone are the days where you had to lock in your bet before a game begins since these days, the best online sportsbooks allow you to wager money on the betting odds in real-time as the game is played, and we are happy to report that MyBookie has this option and its available on all platforms. Betting from your desktop computer was mandatory when online sports betting first became a “thing” but in our rapid, fast-paced society that is ever-growing, we need the ability to bet on sports from our Apple and Android smartphones and tablets and MyBookie has one of the best mobile sports betting apps you can find anywhere. Everything is displayed on a clean, modern user interface that is similar to what you’ll see on the desktop version. Whether you prefer using your personal computer or are always on the go and can only place mobile bets, just know that you’ll have no problems at MyBookie. MyBookie sets the modern standard when it comes to quality 24/7 customer support. Not only were they available super friendly and professional during all of our inquiries with them, but their staff is available from several different contact methods, and this includes phone, email, live chat, and reaching out to them on social media sites like Facebook, Twitter, and Instagram. If MyBookie hadn’t already impressed us with everything else the sportsbook had to offer, then they certainly did with their customer support — which is just the cherry on top of their online sportsbooks sundae.